Regarding Wiring Diagram information, refer to HAC-145, "Wiring Diagram" or HAC-152, "Wiring Diagram". Operate the temperature control switch. Check that the fan speed or outlet changes. NO >> Perform trouble diagnosis for the A/C switch assembly. Refer to HAC-160, "A/C SWITCH ASSEMBLY : Diagnosis Procedure". Is the inspection result normal? YES >> Replace the A/C switch assembly. Refer to HAC-188, "Removal and Installation". Check mode door motor. Refer to hac-162, "component inspection". Is the inspection result normal? YES >> Replace A/C auto amp. Refer to HAC-189, "Removal and Installation". NO >> Replace mode door motor. Refer to HAC-193, "MODE DOOR MOTOR : Removal and Installation". Remove mode door motor. Refer to hac-193, "mode door motor : removal and installation". Check continuity between air mix door motor harness connector and a/c auto amp. Harness connector. Check air mix door motor. Refer to hac-164, "component inspection". NO >> Replace air mix door motor. Refer to HAC-193, "AIR MIX DOOR MOTOR : Removal and Installation". Remove air mix door motor. Refer to hac-193, "air mix door motor : removal and installation". 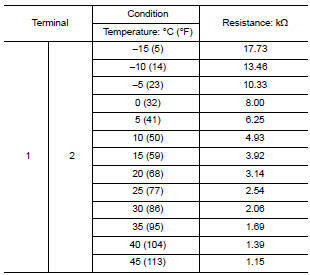 Check resistance between air mix door motor terminals. Refer to applicable table for the normal value. Operate intake switch and check by operation sound that intake door motor operates. Does the intake door motor operate? Yes >> refer to gi-39, "intermittent incident". Check intake door motor. Refer to hac-166, "component inspection (motor)". NO >> Replace intake door motor. Refer to HAC-193, "INTAKE DOOR MOTOR : Removal and Installation". Check intake door motor system is properly installed. Refer to hac-192, "exploded view". Check continuity between A/C switch assembly harness connector M51 terminal 5 and ground. Is the inspection result normal? YES >> Perform trouble diagnosis for the A/C switch assembly. Refer to HAC-160, "A/C SWITCH ASSEMBLY : Diagnosis Procedure". Regarding Wiring Diagram information, refer to HAC-145, "Wiring Diagram"
Regarding wiring diagram information, refer to hac-145, "wiring diagram". Check intake sensor. Refer to hac-171, "component inspection". No >> replace intake sensor. Refer to hac-190, "removal and installation". No >> refer to hac-172, "diagnosis procedure". Check blower relay. Refer to hac-177, "component inspection (blower motor relay)". Is the inspection result normal? YES >> Replace variable blower control. Refer to HAC-194, "Removal and Installation". Perform auto active test of IPDM E/R. Refer to PCS-9, "Diagnosis Description" (with Intelligent Key system) or PCS-37, "Diagnosis Description" (without Intelligent Key system). Does it operate normally? YES >> Replace IPDM E/R. Refer to PCS-30, "Removal and Installation" (with Intelligent Key system) or PCS-58, "Removal and Installation" (without Intelligent Key system). Check ECV. Refer to HAC-180, "Component Inspection".